It isn't uncommon for people to feel there is something missing from their life, and to quest for that missing piece to feel complete. Dr. Curt Connors felt the same way about a missing arm, but his efforts at completeness went completely awry even though they were successful. Dr. Connors found a way to use reptilian DNA to regenerate his arm, but in a striking parallel to Jurassic Park where they used similar DNA manipulations, the cost of the result wasn't worth it. The formula transformed Connors into a creature that, while it had two arms (and a tail to boot), was malevolent and had a personality of its own. One bent on evil with the nom du crime of the Lizard. There's a lesson here - don't mess with reptilian DNA, just like mom used to say. The Lizard first appeared way back in Amazing Spider-Man #6, but has made many subsequent appearances since to battle Spider-Man and attempt to dominate the world with reptile life. The Lizard is as evil as Curt Connors is good, and this is partly due to the dominance of the reptilian portion of the brain that controls aggression. It's also partly due to the fact that he's evil, no matter which part of the brain he's using. The Lizard loves to munch on flesh rather than flies, and he has a speech impediment that makes his ssspeech lissssp at timessss. Diamond Select (DST) and Art Asylum have teamed up to create a new line of busts called the 'Rogue's Gallery' which will focus on the adversaries of Spider-Man. While the Ultimate busts are geared towards characters in the Ultimate Marvel Universe (though most long time fans will agree that the original Marvel Universe is truly the ultimate one) the Rogue's Gallery is going to cover classic Spidey villains from the original Marvel Universe. His enemies define every hero, and that means Spider-Man is among the toughest (and weirdest) heroes around! The interpretations of the characters are not being done towards any specific artist's style but rather to the sensibilities of Art Asylum and Diamond Select. The Lizard is the first in this line of busts and they are scaled to be slightly smaller than the Ultimate Busts from DST. The Lizard does fit well with the Ultimate Spider-Man bust, but is dwarfed by the Ultimate Green Goblin bust. All the Rogues will be scaled to each other and current plans call for a total of nine busts in the line, though that could expand as the line develops. 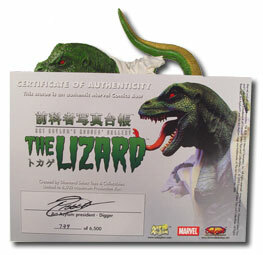 The vision of the Lizard crafted by Art Asylum has a strong influence from dinosaurs, most specifically the Velociraptor and the Tyrannosaurus Rex, both made popular in the Jurassic Park franchise of films. The forked tongue is more a trait of snakes than lizards, though a few do have that anatomical similarity with politicians. The Lizard's tail shoots up along the back of the bust and this version of the Lizard shares one thing with Curt Connors - no arms! 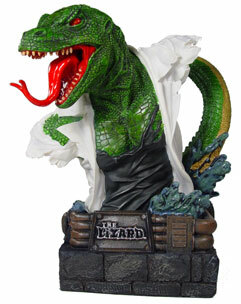 The figure is sculpted with splashing water along the base and a ripped lab coat and undershirt. Every scale is rendered along the chest, back, tail and head to bring the character to life. The base has been designed to depict stonework with piping running around it and a nameplate for the character. The packaging in a white box with images of the bust, and it also has the text duplicated in Japanese. Inside the super-donkey-ultra-pre-formed-padding (that's the literal translation, we know it as Styrofoam) the bust rests until released. The box's white look stands out from the usually colorful look of comics-based packaging, and it's a classy look that sets the box apart. There are 6500 nearly identical (or as identical as possible when made in a Chinese factory), and each one has a certificate of authenticity in full color that is numbered individually and signed by Art Asylum president Digger. Feel free to sign underneath as the 'make-believe Art Asylum president'. Everything from the concept to the final piece sculpt and paint was created by Art Asylum and the Lizard was created by Steve Ditko and Stan Lee. Art Asylum may be getting plenty of attention from the new Star Trek line, but comics-based work is where they built much of their reputation, and that is well earned when presented with this bust. One thing is certain - being bad has never looked so good. 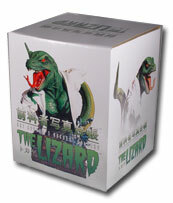 Where to buy the Lizard Bust: This piece is limited to a run of 6500, and you can find it at your local comics shop and various online retailers for between $35 and $45 USD.